Maps of the world are fascinating to look at, and they are great tools for teaching children about the world they live in. Map posters are a great touch to add to a child’s room, and they will love learning about where different places are in relation to one another. They are also ideal for helping supplement learning in the classroom, and are excellent tools for a homeschooling family. There are many different types of map available, and you might not be sure when is the best time to buy your child their first map. Here, we have done the hard work for you, and reviewed some of the best maps of the world aimed at children. You will be spoiled for choice with our great picks! 2.0.1 What are the Benefits of Having a Map for Children? 2.0.2 What are the Different Types of Kids Maps? 2.0.3 At What Age Should I Buy a Kids Wall Map for my Child? There are a few things to think about when it comes to choosing a map for your child’s bedroom. The first is the age of your child, and their reading ability. For toddlers and young children, you will want to choose something simple which is not too highly detailed. One with bright colors and pictures is ideal at this age, especially if they can’t yet read. When you child gets a bit older, they might like something which is more informative, perhaps with some fun facts about the different countries. Some maps also show the flags of each country, something which often interests older children. You should also be aware of the space you have available when choosing a map – some can be quite large so will need a lot of free space on the wall! Maps come with different features so think about what your child is interested in too. Some are interactive and will tell your child facts about the different countries, whilst others can be drawn on or customized. Below, you will find our reviews and ratings of some of the kids’ maps on offer today. You are sure to find the one which is just right for you and your child. 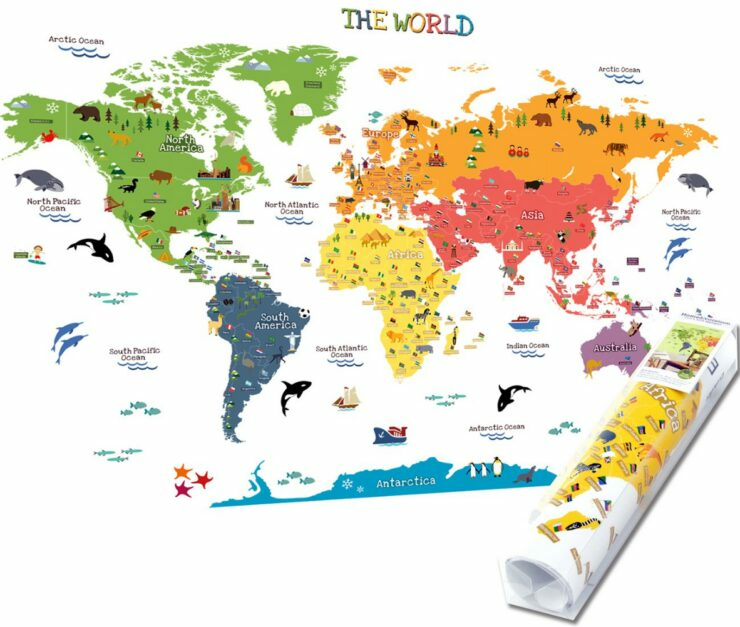 This map of the world for kids is printed on artist-grade canvas and has dimensions of 16 x 24 inches, which is approximately equivalent to A2 size. The canvas is great for kids because it can be cleaned with a dampened cloth should it get dirty. It’s easy to hang on the wall too – all you need is a nail and it’s ready to hang. The continents map for kids clearly labels each continent in a different color, so children can learn where they all are with ease. The map also shows some of the main landmarks found in each area, such as the pyramids in Egypt, the Taj Mahal in India and the Amazon rainforest in South America. The world map wall decal is excellent for giving your child’s room a makeover. It can be customized to different sizes, and can even be made large enough to cover a whole wall. The textile wallpaper comes with the glue which is needed to apply it. However, it can be removed and applied elsewhere if necessary. The map wallpaper shows the animals of the world and the region where they come from. This makes it great for kids – all kids love animals! The wallpaper is long-lasting and won’t become damaged by humidity or water. It is also not flammable and is UV-resistant, so you can be sure it will continue looking great for many years to come. 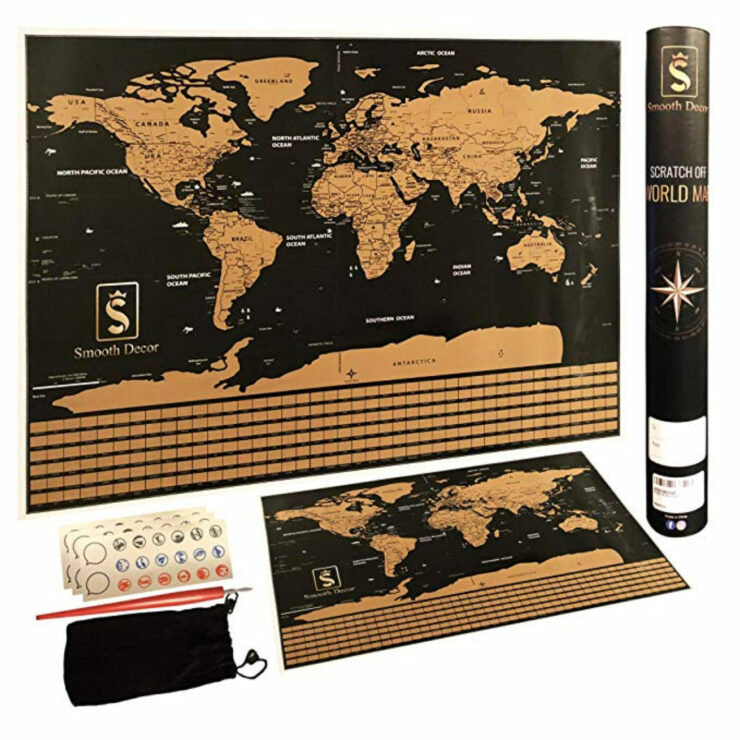 This scratch off world map poster is an excellent gift for kids who travel a lot or have plans to travel the world! This is a highly detailed map, which features all US states and every flag of the world. The extensive kit also comes with a special scratching tool as well as memory stickers to apply to the map. The map comes contained within a tube, which is perfect for giving it as a gift, or storing it safely if not displayed on a wall. The children’s map looks great on the wall – kids will love showing off how many locations they have visited. It can also be used for planning future trips, making it great for teens who might be heading off on their own adventures. When scratching the gold surface off, the map won’t be damaged as it is made from top-quality laminated paper. After scratching, kids will be able to see famous landmarks in the country as well as some of the major cities found there. 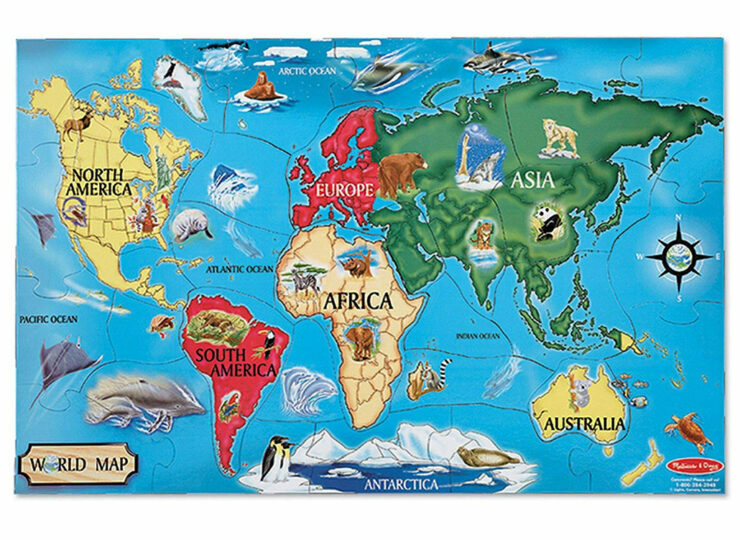 This world map jigsaw puzzle consists of 36 pieces, making it excellent for children over the age of 3 years old. Each continent is a different color on the map, so kids will quickly learn to recognize them. The pieces of the puzzle are large and chunky, perfect for children to grasp easily. The finished puzzle measures 19 inches in diameter, which is a great size for kids to view the details of the map. The puzzle comes with a diagram showing how to build it. Kids can simply lay the diagram on the floor or table and build the puzzle on top of it until they learn how to do it unaided. Kids will love looking at all the animals of the world and learning where they come from. The sweet graphics and nice color scheme make this puzzle attractive and fun for kids of all ages. This interactive world map for kids is suitable for children aged 5 years old and above, and it is sure to teach them loads! Kids can use this map to learn world capitals, flags, which languages are spoken in each country as well as other fun facts. They will also learn about the major landmarks of the world – which might make them want to do some traveling! The talking map features over 1000 facts so kids will never get bored of using it – they are sure to learn something new every time. Once they have listened to many of the facts, they can test their knowledge using the built-in quiz. The map requires 3 AAA batteries for operation, which are included. It also features a volume control, which is handy for parents! The map is ideal for use on the floor, so the whole family can gather round and learn something new. This world map wall sticker set comes in an extra large size, meaning it is great for filling a wall. When arranged together, the stickers will cover an area of around 55 x 43 inches. They are easy to apply to the wall, and if you fancy a change they can easily be removed without damaging the wall underneath. The stickers come on three separate sheets, meaning they can be arranged as you wish. On the map stickers, continents are clearly labelled and each is a different color. There are also lovely images of animals and plants typically found on each continent, which is sure to interest kids. These wall decals are great for brightening up a playroom or nursery, and are sure to be enjoyed for many years to come. This kids wall world map and USA map set is basic yet interesting to look at and clear to read. On the map of the world, countries are shown in a single, bold color with their name clearly printed. On the USA map, you will also find each state capital shown, which is ideal for helping kids remember them! The laminated map poster set is excellent for hanging in your child’s bedroom or playroom. Each map measures around 18 x 24 inches, which is a great size to display on the wall. The paper and the lamination are both durable and thick, meaning these maps will withstand the test of time. This world map decal is large enough to quickly and easily give your child’s room a whole new look. Continents are color-coded so they are easily distinguishable. On each country, you will see the flag of the country next to its name. There are also images of animals, plants and landmarks found in every part of the world. The stickers are easy to apply to the wall. They come on two sheets so you have to take care to arrange them in the correct order. However, this won’t take long and they can be re-positioned without leaving a mess on the wall. They work well on any surface as long as it is smooth and dry. This is a great world map for kids rooms – it has a classic and traditional look, yet also includes some fun features to make it more interesting to children. The map shows country names, capital cities, mountain ranges and animals, plants and landmarks of each country. Another great feature of this map is the border around the edges which is made up of all the world flags. The world map wall poster is ideal for school-aged children, as it is quite detailed so likely won’t appeal to younger children. Kids will learn so much about geography by looking at this map, and they will love to ask questions to find out more. It is an excellent educational tool for curious kids. It’s printed on heavy paper and is also laminated so it can be written on with dry-erase markers for teaching purposes. This illuminated globe is excellent for teaching kids about the world and it also doubles up as a nightlight. It measures 8 inches, yet is easy to read. Kids can learn about world capitals, deserts and more with this educational globe. The base of the globe is specially designed to ensure it does not tip over and is also durable enough for little kids to handle. The LED globe is ideal for sitting on a nightstand or desk, where kids will love to look at it and learn something new. There is a switch to easily switch the lights on or off, and it requires 4 AA batteries to illuminate. The cord-free design is great for kids as it reduces tripping or choking hazards and also looks better on display in the room. This is another great interactive map for kids aged around 5 – 10 years old. It teaches facts about over 90 countries. Facts include population, flag design, and landmarks which can be found in each country. Kids will never get bored with playing with the map, as it has over 1000 facts to keep them entertained. This is a great gift for kids at Christmas or on their birthday as it offers hours and hours of potential entertainment. The map can be used on the floor or at a table, and is also wall-mountable. So, it is versatile and can be used in a variety of ways depending on what kind of space you have available. The map is easy to use – just press the buttons across the top to change between different modes. Kids can also choose the quiz mode to test themselves once they feel they have learnt enough facts! The map offers something a little different from the others – it can be used in the bathtub! It comes in the form of a jigsaw puzzle, measuring 20 x 10 inches and consisting of 29 pieces. The pieces are made from foam and can stick to the bathroom tiles once they are wet. 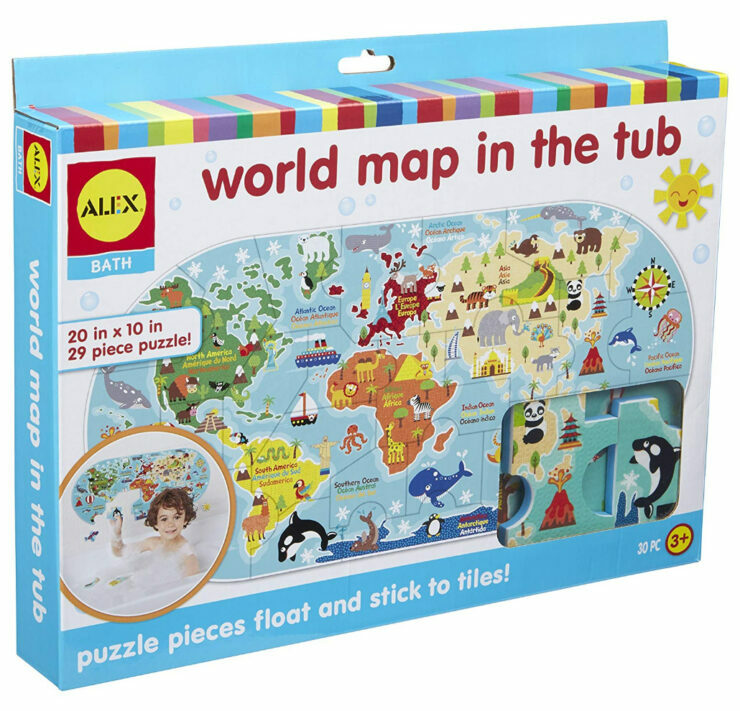 The map puzzle is aimed at children over the age of 3 years old and it is guaranteed to make bathtime more fun. The puzzle pieces can conveniently be stored in the included mesh mag, which also has suction cups to help it stick to the side of the bath or the wall. On the map, kids will see animals and famous landmarks, so they can learn where they come from. The puzzle is a little difficult to piece together as the pieces are differently shaped compared to most puzzles, so a little help might be required from mom and dad! 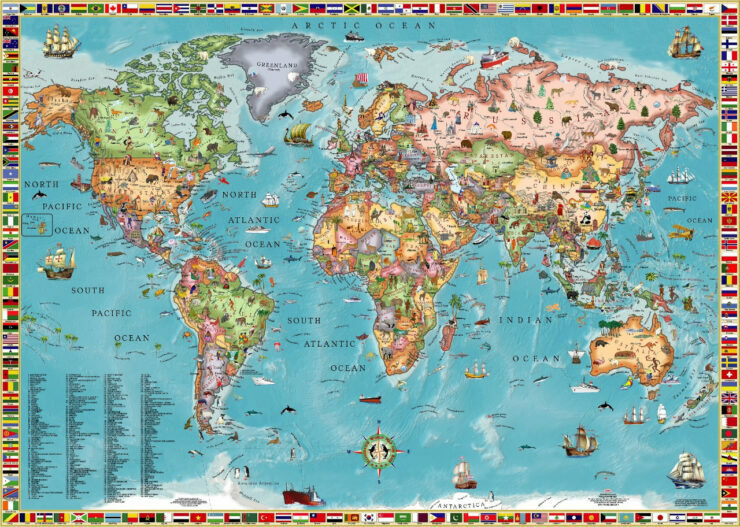 This world map puzzle is made by trusted and loved manufacturers Melissa and Doug. It consists of 33 pieces and the finished puzzle stands at 24 x 36 inches, making it a great one for building on the floor. Kids will find continents clearly and simply labeled, as well as country boundaries marked out. There are also a few animals included on the map. The puzzle is ideal for children aged six years old and above, as it is a little difficult to piece together. There is also a compass shown on the map which is ideal for familiarizing kids with their directions. The puzzle pieces are large and durable – perfect for kids. 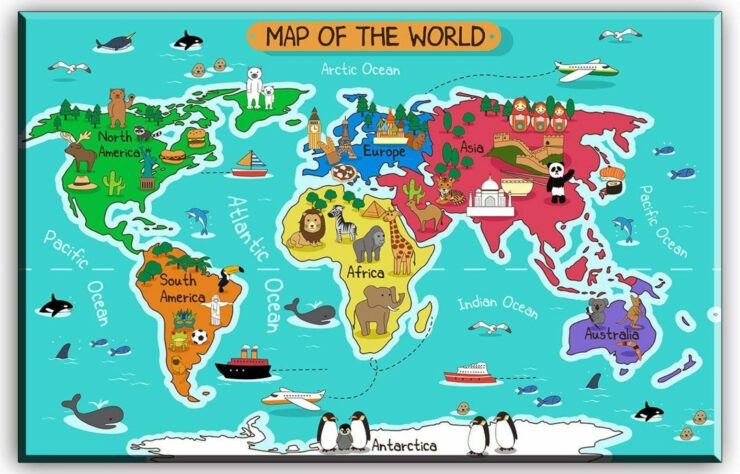 This is a great world map for a nursery as it features sweet images sure to capture the attention of younger children. It features a simple design with the continents and oceans labeled, but not the individual countries. There are also images of the typical plants and animals found in each region. The map measures around 47 x 33 inches, which is a great size for brightening up a room. It’s also printed on thick, glossy paper to ensure it looks good and will stand up to the test of time. 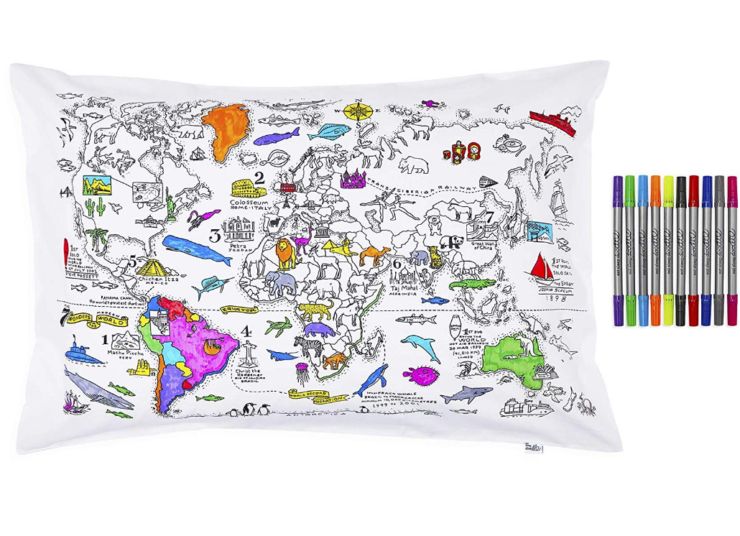 The Doodle Pillowcase is a fun and unique way of teaching kids about geography. It comes with 10 different colors of fabric markers which can be washed out allowing the pillow to be customized time and time again. The case measures around 30 x 20 inches, so kids can easily see the details on the map. Kids will learn about different animals of the world and can see some of the main landmarks of various countries, so it’s great for expanding their general knowledge. Once the pillowcase is colored in, it will look great sitting on your child’s bed or on a chair in their room. They will love showing off their new map! Coloring it will keep them amused for hours, and once they are done they can start all over again after washing and create a whole new look. This is an excellent gift for slightly older children who are interested in learning about the world. There are loads of amazing kids maps out there, so choosing which is best is difficult. However, after careful review the one we highly recommend is #5, the Interactive Map. This one can teach your child so much, and will keep them amused for endless hours. It’s also suitable for a wide range of age groups, meaning siblings can share it and enjoy learning together. Whatever your child is interested in, whether it’s flags, landmarks or capital cities, they can learn it all with this great map. We love the quiz function too, which helps kids put their knowledge to the test and see how much they can remember. What are the Benefits of Having a Map for Children? There are loads of benefits of buying your child a map for their bedroom. Maps can teach children spatial thinking skills – where countries are in relation to one another and their varying sizes for example. Kids can of course learn about different countries through maps too. They can discover whether a country is land-locked or not or if it is mountainous or flat for example. This can then encourage them to do some research into the country to find out how life is for the people who live there – helping them to learn about different peoples and cultures. What are the Different Types of Kids Maps? There are many different styles of map which might interest your child. Of course, there are traditional globes and wall posters, but there are many more to choose from too. Interactive maps are excellent for kids – by touching various points on the map, it will respond with phrases to teach your child fun facts about the world. There are also map puzzles for kids to learn about the world as they build. Some globes have lights inside them so they can also function as a nightlight. You’ll also find maps which can be colored in, as well as scratch maps which allow kids to scratch off the countries they have visited in order to reveal a colorful map underneath. At What Age Should I Buy a Kids Wall Map for my Child? Kids are never too young to start learning about the world. You can find maps of the world for kids as young as 3 years old. It’s more important to choose something which is age-appropriate in order to keep them interested. Each map comes with its own suggested age range, so you can check before buying whether or not it might be suitable for your child. Older children are likely to be more interested in maps and geography – once they start school they will probably appreciate a map more. If you are not sure whether or not your child will be interested in a map, you could try a printable world map for kids first, before investing in something more substantial.